The IAS officer, who was re-transferred today, said she had been move from the post of Deputy Commissioner of Hassan at the behest of Siddaramaiah as she had curbed illegal sand mining. 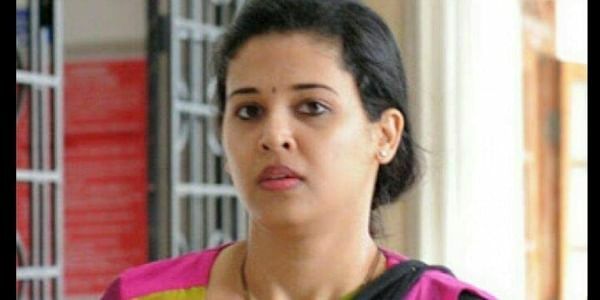 BENGALURU: IAS officer Rohini Sindhuri Dasari, who had taken on the state government and the political bosses, has won the legal battle over her transfer and returned as the Deputy Commissioner (DC) of Hassan on Monday. The state government was compelled to submit before the Karnataka High Court that it would reinstate her. She had in her petition contended that she was transferred from the post of DC prematurely on March 7, 2018, at the behest of then CM Siddaramaiah who allegedly heeded to the pressure of local leaders as she curbed illegal sand mining in Hassan. Rohini was transferred after her running tiff with the local leadership and then district in-charge minister A Manju, against whom she had booked a case of poll code violation. The minister-officer battle ultimately turned into one between the minister and the first family of Hassan, H D Deve Gowda and his sons. The minister suffered a defeat in the Assembly poll. She had challenged her transfer order at the HC and Central Administrative Tribunal (CAT), citing it as premature and politically motivated. On Monday, within hours after the government gave the undertaking before the court, Rohini was transferred back as Hassan DC with immediate effect to replace P C Jaffer. A notification was issued in this connection. Earlier in the day, the high court set aside the judgment of Bengaluru bench of CAT which upheld her transfer as Commissioner of Employment and Training by the then Siddaramaiah government. Rohini’s plea was disposed of after the submission of Additional Advocate General A S Ponnanna before a division bench of Justice H G Ramesh and Justice Mohammad Nawaz that she will be transferred again as Hassan DC. This shows Congress is favorable to illegal activities and dishonest officers. No wonder whistleblowers are either killed or shunted out or true honest officers and bureaucrats are punished. Congress or JDS is not bothered about the death of the officer in UP when he was serving Karnataka. Nor BJP in Up is doing anything about or the earlier deaths of CMOs. Let politicians know that it is not a game to play with such firebrands and sincere officers. This is a rare case where an IAS officer took her fight to the HC. Hope and pray that more and more IAS officers stick to”Rules”and keep the”Administration”clean. My “SALAAM” to the brave lady.